I am all about blush right now. If it’s blush, I probably want it, or own it. Back in November, I fell in love with a blush skirt from Brandy Melville, and for some reason, I didn’t buy it. I went months thinking about it, looking at it on their site, but never buying because those shipping prices were NOT my friend. When I went to California in early March, I came across it again and bought it. Needless to say, I was a happy girl. I have always been that girl that loved to buy skirts and dresses – but never wear them. So, I was on a mission. I wanted to create outfits I could pair with this skirt so I had no excuse to let it sit in my closet like a trophy. I was going to wear this skirt. I first decided to venture out and find a way to wear this skirt when it was still a bit chilly outside. I decided to pair it with a gray turtleneck, and I figured if I had to, I could throw on some sheer tights as well to keep my legs a bit warmer, although (luckily) the weather in Utah has picked up a little bit. A pair of boots can easily tie this outfit together. Although, you could add necklaces too. Jean jackets are a closet staple. Seriously, if you don’t have one INVEST! They look good with everything! This one is from Michael Kors, and it is my all time favorite. I paired my blush skirt with a jean jacket, black tank top, and some layered necklaces. I found that without the necklaces the outfit looked somewhat blah. The necklaces helped break it up. I am loving Katie Waltman Jewelry, (and her clothes!) and these necklaces were a perfect add. And as a tip, when layering necklaces, always layer in threes! I love the look of band t-shirts, especially this one. Something about them looks so effortless and edgy. I always try to buy mine one size too big so I can tie them in the front. I specifically wore it tied, but they look great tucked in as well! When tucking them in, make sure it lays flat under the skirt so it doesn’t cause any bunching, I mean who wants fake love handles? I paired mine with my favorite brand of baseball caps and some bracelets. You can’t go wrong with layering bracelets when wearing a band t-shirt. Lastly, this one is for those who love to dress girly. I’m with you on this one! There’s something so cute and feminine about a delicate top and a cute skirt. Pastel colors are so flattering and spring is a perfect time to start trying them out. If the top is loose on you, you can easily tuck it in or leave it out! Both can create a flattering look. This post contains affiliate links. I may receive a commission, at no extra charge to you, if something is bought through the link. While this skirt is from Brandy Melville, their sizing is an enemy, so I have found a few other skirt options (with actual sizing). This one from MinkPink has buttons on the front, but comes in this pink color. A great place to try and find some is Forever 21. They have a ton of options, some of which I have linked below. Don’t forget to comment and let me know which outfit is your favorite! Yes! Love all of these! I love that the skirt totally gets a different vibe depending on what pieces you paired with. So cute! Thank you so much! I never realized how versatile it was until I really cracked down on it lol! Wow, your skirt is lovely! And I’m loving these pictures. Cute outfits! I’m loving the skirt with the jean jacket. I am the same way, I buy skirts and dresses and never wear them. I’m such a jeans loving girl that I have to be really intentional about wearing a dress or skirt, otherwise I just don’t think to wear them. Thank you so much! Seriously, it is so hard to find the right time to wear them! My absolute favorite definitely has to be the graphic T-shirt! They always have a special place in my heart!! Also loved how you knotted it in the front! Love the interest! Than you so much! Same here! Something so comfy about cute about them! Thank you so much! That might be my favorite too! Perfect for summer! This skirt is such an adorable find! I personally love the pairing with the denim jacket. My second fave would have to be the graphic tee. Thank you so much! I was surprised how well they turned out! Who would’ve thought! I agree, I LOVE a denim jacket! I also really like the lacy cream top with it, I never would have paired that. Cute!! Thank you so much! I actually didn’t mean to pair them but ended up loving it! That skirt looks so cute on you! I love the pink wall too! I don’t think I could pull it off. Thank you so much! HEY! You never know! Thank you so much! I’ve heard that I look just like her for years so i’m totally used to it no worries! That’s funny you’d think the same! I love all of your pictures and your hair is so pretty! This skirt is so adorable! I love the color of it and it is so versatile. That you so much! It totally is and I never would have thought that at first! You’re so cute! I love all of the looks but I think my favorite is the simple gray long-sleeve top and booties. 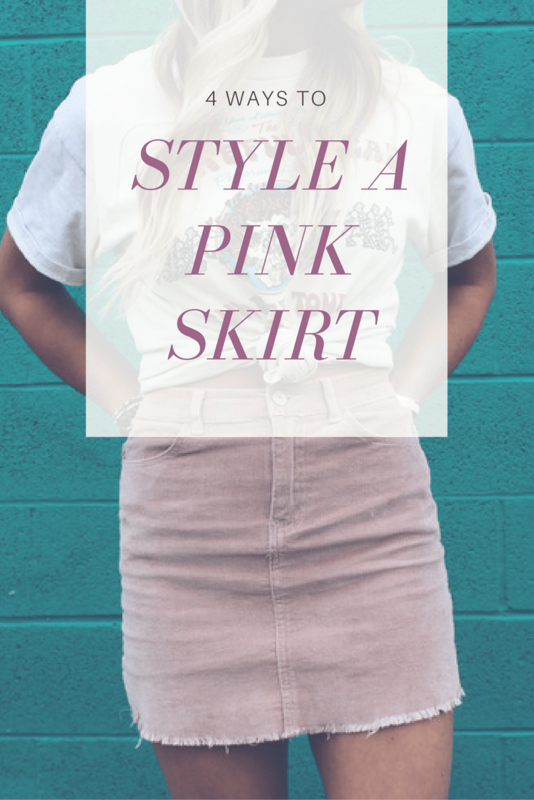 Great casual looks with that blush skirt. Blush is such a good almost neutral! Thank you! It’s like a small upgrade from neutral colors! So cute! LOVE it with the band tee! All the looks are so cute – but my favorite is the last one! I am such a fan of lace and love the delicate fabric combined with the thin straps. It’s a great contrast to the denim. Thank you! I love delicate fabrics and they look so cute with skirts too! Thank you so much! It’d be perfect for spring! Plus there is tons of options that are longer, brighter, or have a few tweaks to them that make them even more unique! Thank you! They are so adorable! Definitely one of my new favorite finds! 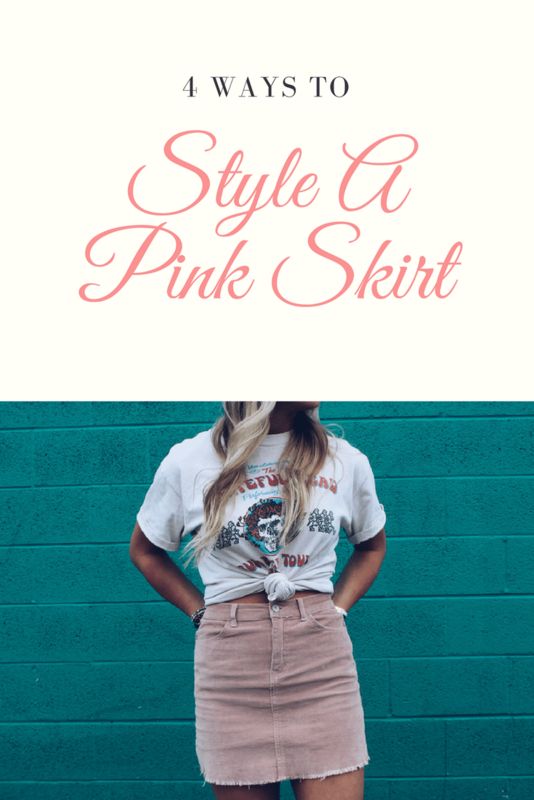 This is a super cute spring/summer skirt and you could easily add tights and a jacket to it to transition it to a fall skirt (I am big on wearing pastels in any weather). Thank you! That’s exactly what I was thinking! Thanks so much! Oh no way! That’s so cool! Casual and chic! I love it and I like that you showed different ways to wear it because it never gets boring. Great sense of style! I love the third one! The band tee looks so comfy and cute! Thank you so much! It def is! I LOVE this skirt!! I always have such a hard time pairing shirts with skirts. This is so perfect! I love all the ways you styled it! Thank you so much! I struggle all the time too! Such a cute skirt, and I love all the different ways you paired it. You look amazing! Cute options. I love the pairing with the tee shirt. Super adorable and looks comfy. Aloha! I love it! It’s girly but casual at the same time! Pink blush is spring’s color too! Love this style! So adorable. It’s the perfect shade of blush. Thank you! Yes it seriously is! The look created with denim jacket is my personal favourite 🙂 You look gorgeous in all. So hard to choose… hmmm… you look great in all of them! Maybe for myself the one with denim jacket. You look so beautiful and I love how each style looks!!! I don’t have enough confidence to wear that color for some reason, but I love it and think you look great!! Thank you! You should totally give it a try! It seriously is flattering on every skin tone and as a pastel, it doesn’t draw too much attention to your waist or anything either! Blush is everywhere this season! We are seeing it all over our office and loving this trend. Awesome! I am so happy to see this color everywhere, i’m obsessed! Wow you look really cool! I love the skirt! This looks like the perfect skirt for spring. I love how you’ve styled it so many different ways. Thank you! I’m seriously so excited for it to get a little warmer so I can wear it all the time! cutie, look two is my fav! You look beautiful! I actually didn’t own a ton of blush until I was asked to be a bridesmaid and my BFF wanted us to find blush dresses. Now I LOVE IT! All it takes is that one time and instantly you’re stuck on the color! Thank you so much! Omg what a cute skirt!!! I have a tulle skirt this color I wore for Valentine’s Day and just love it!!! Thank you! Ooh sounds so cute! I love tulle skirts but have yet to own one! so long ? Ha ! Thanks so much! Ah what a great compliment! I love the second look, and how you styled it with the graphic tees. I own a lot of them so this is perfect! Thank you! It’s a great way to spice up your graphic tees for sure! Love it with the jean jacket and the knotted top! So cute! I love the color. I’m scared to wear it though because of fear of staining. Nice pairings though. It looks really nice. Thank you! I totally get that! I have to be super careful with it! I’ve been into blush anything-and-everything these days! Just love it! This skirt is soooo cute and looks great with your grey top and little booties! Love! Thank you so much! Definitely a good way to wear a skirt in the colder months! What a cute skirt! This is definitely a good wardrobe staple. I love all the outfits but number one is my favorite! Thank you so much! I totally agree it is a staple piece! I’m so loving Blush this season!! You have so many cute looks .. loved them all! BTW.. you could totally be the third "Spears" sister.. lol you look just like Brittany and Jaime Lynn!! Thank you! I get that all the time lol! You are so darn cute! And now I want the skirt! You’re seriously the cutest. Love these looks! 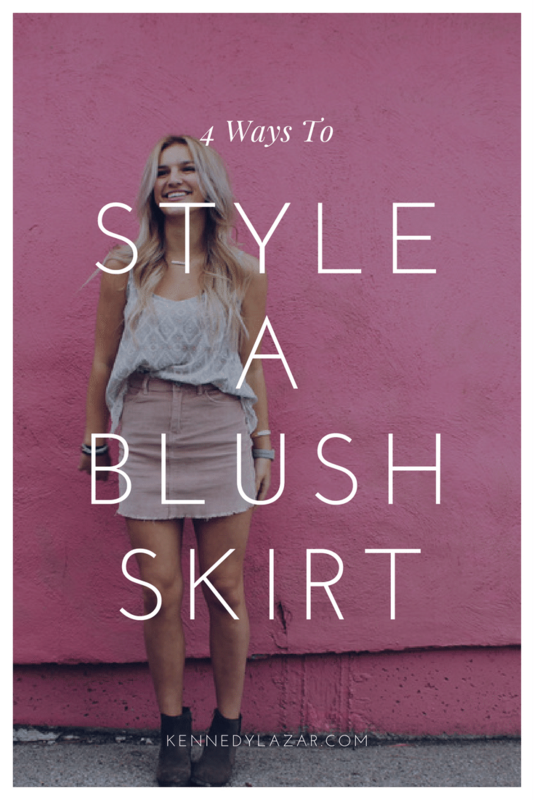 This is SO cute!I I love all the different ways you styled it from casual to fun & flirty! You are killing it! I love this skirt so much! The first outfit is definitely my favorite, though they all look so cute on you 🙂 Now I want a skirt like this one. Thank you! Totally get one they are perfect for spring! One of my favorite items in my closet at the moment! 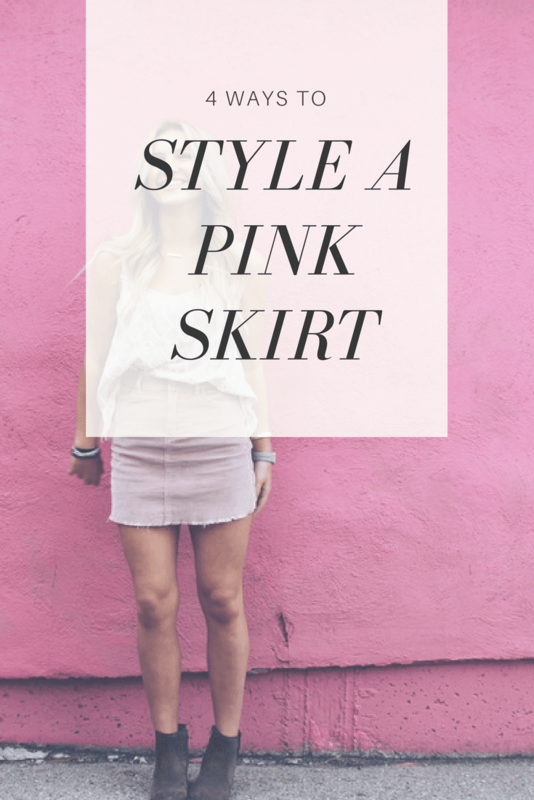 Great post dear & I’m now in love with blush skirts!! Love all the different looks you created! Thank you so much Mouna! Love your styling ideas, the outfits all look gorgeous! Love your second and fourth looks! Second looks super casual and cool without trying and love the feminine top in the last look.